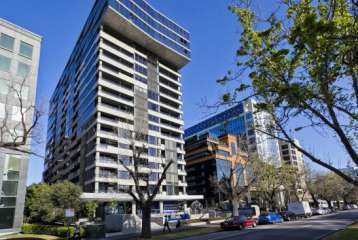 The St Kilda Road Parkview is a 4 star hotel and conference venue situated on St Kilda road only minutes from the centre of the city. 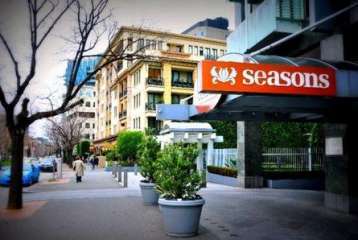 The hotel is popular with conference delegates as it is close to the cafes, restaurants and shopping of the bayside St Kilda, while the central business district of Melbourne is only a short tram ride away. 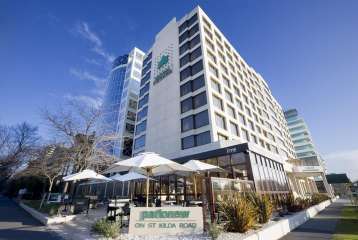 The St Kilda Road Parkview hotel offers on-site parking a gymnasium, restaurant and bar and with the park just next door conference delegates can enjoy a more relaxed inner city environment. 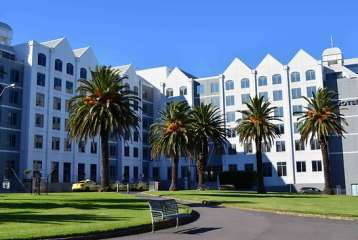 Novotel St Kilda is a 4 star hotel and conference venue in the popular bayside suburb of St Kilda. Known for its vibrant lifestyle, great restaurants and cafes, lively entertainment venues and unique shopping experiences St Kilda is a great location for a conference or meeting within 1 hour of Melbourne Airport and 30 minutes of Melbourne city centre. This conference venue offers a selection of versatile meeting rooms including a ballroom that can seat 280 people in a Theatre Style setting. Novotel St Kilda also offers first class catering and accommodation, this is a conference venue that your delegates will enjoy. 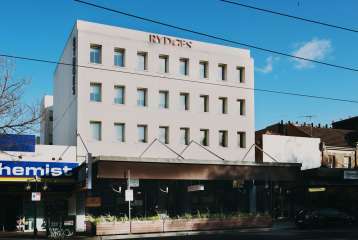 Rydges St Kilda offers conference organisers a boutique venue with contemporary style and only 5 minutes walk from St Kilda Beach. St Kilda is a destination that attracts a vibrant crowd and offers some great cafes, restaurants and bars, art galleries and boutique clothing stores. 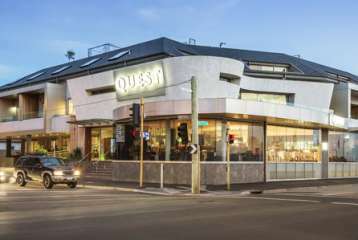 Quest Brighton on the Bay is a hotel and conference venue that is popular amongst meeting planners with small groups who need modern facilities and quality accommodation, close to St Kilda and just 45 minutes from Melbourne airport. The Conference room can be divided into 2 sections offering the space for workshop and smaller group sessions. The hotel rooms are spacious comfortable and great for residential conferences that may require delegates to be accommodated for several nights. Park Regis Griffin Suites is a conference hotel that offers meeting planners exceptional value in a convenient and popular location, just over 30 minutes drive from Melbourne Airport and a short tram ride from both the City Centre and St Kilda. The Hotel has 2 meeting rooms that both offer natural light and is well suited to smaller groups on multi day training programs, conferences, planning sessions or board meetings. 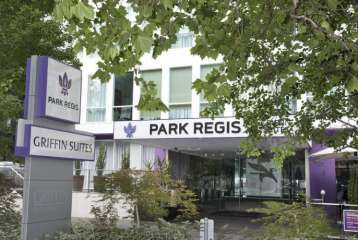 Park Regis Griffin Suites offers comfortable modern hotel rooms and apartment style accommodation along with onsite parking, restaurant and bar. The Art Series of hotels is a truly unique venture; three incredible and inspirational establishments that take inspiration from Australia’s best loved artistic minds. This one takes its name, ethos and style from Charles Blackman and specifically his acclaimed Alice in Wonderland series. The Blackman Hotel offers high quality accommodation and meeting rooms in an enviable location on St. Kilda Road just moments away from Melbourne’s CBD. This is a conference venue suitable for small groups that will certainly entertain and enthuse your delegates. 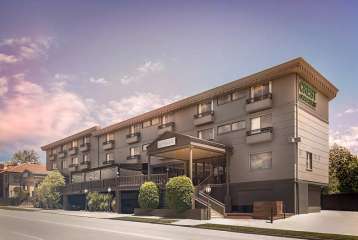 Located within easy reach of both Melbourne CBD and St Kilda, Crest on Barkly provides meeting planners with good quality and affordable business meeting facilities along with comfortable corporate standard accommodation. The largest conference room can seat up to 300 delegates in a Theatre Style setting. Pullman & Mercure Melbourne Albert Park has recently undergone a major refurbishment, with all rooms and public area now providing a modern and stylish environment for guests and conference delegates to enjoy. Pullman & Mercure Melbourne Albert Park offers one of Melbourne’s largest and most comprehensive conference, convention and meeting venues. 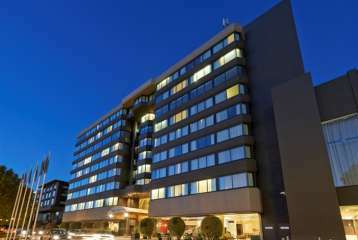 Bayview Eden is a 4 star hotel and conference venue located midway between St Kilda and Melbourne CBD which offers meeting planners a convenient location, professional conference facilities and great value. The venue features a large Ballroom on the first floor that can seat up to 450 delegates and can also be broken up into smaller rooms that are well suited to breakout and workshop sessions. Conference organisers will appreciate the flexible spaces, comfortable accommodation and budget friendly pricing. 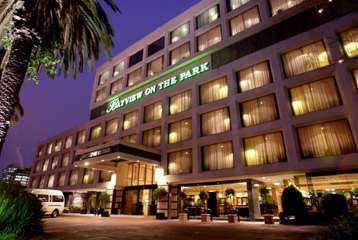 Bayview on the Park is a popular 4 star conference venue in Melbourne. It owes its popularity to its location which is convenient to both Melbourne CBD and St Kilda, its high quality, flexible meeting rooms, its spacious comfortable accommodation and its prices which are frequently among the lowest 4 star venue rates in Melbourne. The Lakeside ballroom can seat several hundred people and can be used for exhibitions, trade displays, seminars, gala dinners along with conferences and meetings. The conveniently located Mantra St Kilda Road is an elegant, art deco building with fabulous artwork and superb finishing touches. Perfect for small business meetings, traing programs and conferences, it is situated in the heart of the St Kilda Road business precinct, just a walk from world class shopping and dining, a short tram ride from St Kilda and close to the CBD’s iconic attractions. The Royce Hotel is one of Melbourne's special conference venues. Only a short drive or Tram ride from the CBD and just a short walk to some great restaurants and bars, the luxurious boutique accommodation, elegant contemporary meeting rooms and first class dining make this a conference hotel that your delegates will enjoy. 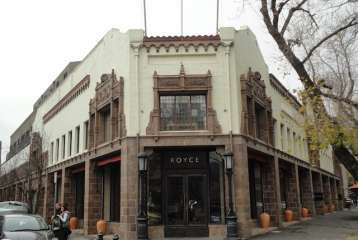 The Royce Hotel is well suited to smaller and medium sized events, residential conferences and executive meetings. 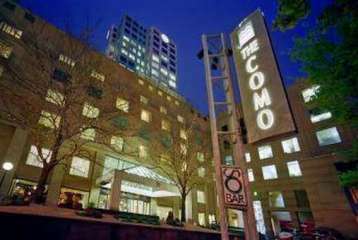 The Como Melbourne MGallery by Sofitel is a modern luxury hotel located in the very heart of South Yarra and offers conference delegates first class accommodation and facilities. This luxury Hotel and conference venue is located within a short stroll of some of Melbourne's finest restaurants, cafes, boutiques and gardens. South Yarra is just 10 minutes from the Melbourne central business district. The Como Melbourne provides conference organisers with a unique and luxurious setting for small to medium size conferences, board meetings, training seminars or corporate events. Seasons Botanic Gardens is conveniently located between St Kilda and the Melbourne CBD overlooking Melbournes beautiful Royal Botanic Gardens. The location offers the convenience of proximity to the city centre with its corporate offices, government departments and tourist destinations and St Kilda with its restaurants cafes and fashionable boutiques while providing a relaxing park side atmosphere for conference delegates to enjoy. 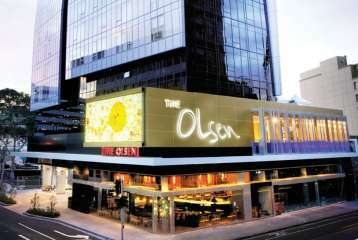 The Olsen, one of the Art Series Hotels, is a premier 5 star boutique hotel and conference venue on Melbourne's popular and fashionable Chapel Street, just 10 minutes drive from both the CBD and St Kilda and surrounded by some great restaurants and bars. The hotel is just 30 minutes from Melbourne International Airport. This conference hotel features the wonderful artwork of Dr John Olsen, one of Australia's most celebrated artists. The Olsen offers spacious modern accommodation, high quality food and a selection of elegant meeting rooms with natural light.